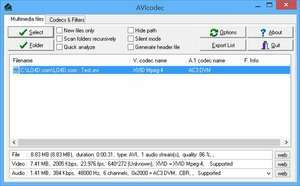 AVIcodec is a small utility which can display which codecs are required in order to watch video files or listen to audio. The application includes a user-friendly user interface which doesn't have too many bells and whistles outside of the technical information it provides about video and audio files. AVIcodec can be especially useful for people who wish to maintain a clean system and only install the codecs they require. A useful function of AVIcodec is its batch operation mode which can process multiple codecs at once. Version 1.2.113 Beta is a freeware program which does not have restrictions and it's free so it doesn't cost anything. For security reasons, you should also check out the AVIcodec download at LO4D.com which includes virus and malware tests. Additional screenshots of this application download may be available, too.